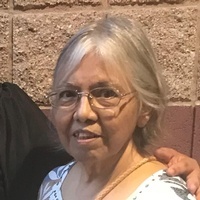 Maria “Margarita” Garcia Soto age 67 of Dalton, departed this life Thursday, October 11, 2018 at her residence surrounded by her loving family. Margarita was born Feb. 4, 1951 in Del Rio, Texas. She was preceded in death by her father, Guadalupe Garcia. She was a loving wife, devoted mother and grandmother, daughter and sister, who loved her family deeply. Her life was spent caring for her family. She loved reading and crossword puzzles. She was a member of Saint Joseph’s Catholic Church. She is survived by her husband, Andres Soto Acevedo of the residence; mother, Rafaela Galvan Garcia of Comanche, Tx. ; sons and daughters-in-law, Andres and Jade Soto, Rafael and Corina Soto; daughters and sons-in-law, Maria and Jose Castillo, Rosario and Luis Magana, Isabel and Salud Pimentel, and Amanda and Spencer Singleton; grandchildren, Elissa Lopez, Emiliano Lopez, Joshua Magana, Louis Magana, Andrea Martinez, Michael Pimentel, Lily Pimentel, Daniel Pimentel, Abram Pimentel, Emerie Soto, Austin Soto, Ivannah Soto, Stella Soto and Aliyah Soto; great-grandchild, Sebastian Martinez all of Dalton; brothers, Jose Garcia of Arlington, Tx., Steve Garcia, Eddie Garcia both of Denton, Tx., George Garcia of Comanche, Tx. ; sisters, Angie Sauste of Comanche, Tx., Eleanor Garcia of Garland, Tx., Susie Mendoza of Comanche, Tx., and Lucy Rodriguez of Ft. Worth, Tx. ; several nieces, nephews and many cousins. Mass of Christian Burial will be celebrated, Friday, Oct. 12, at noon at Saint Joseph’s Catholic Church with Father Duvan Gonzalez officiating. She will be laid to rest at 11 a.m. Saturday morning at Ponders Whitfield Memorial Gardens with her sons and grandsons serving as pallbearers. The family will receive friends at Ponders Melrose Chapel from 6-9 p.m. Friday and after 9 a.m. Saturday until the graveside service. Ponders Melrose Chapel will announce finalized arrangements, Dalton, GA. (706) 226-4002.